Attempt To Re-Create ‘Big Bang’ Begins March 2015 – Will Gates Of Hell Soon Open To The Destruction Of All Creation? With the reopening of CERN’s ‘large hadron collider’ in March of 2015, two leading and well respected scientists, theoretical physicist and cosmologist Stephen Hawking and Astrophysicist Neil de Grasse Tyson, have recently issued independent warnings that, when looked at through the eyes of the supernatural war taking place right now upon our planet Earth between the forces of good and evil, send us a clear message: “This is it!”. The reopening of CERN will bring together scientists playing with unknown forces, attempting to re-create the ‘big bang’, as shared in the 1st video below, the moment of the creation of the universe. Dr. Stephen Hawking recently warned that the reactivation in March of CERN’s large hadron collider could pose grave dangers to our planet…the ultimate reality check we are warned. Hawking has come straight out and said the ‘God particle’ found by CERN “could destroy the universe” leaving time and space collapsed as shared in the 2nd video. Is CERN the most dangerous thing in the cosmos that could lead to the ultimate destruction of the Earth and the entire universe? Recent developments prove to us the scientific community is no longer able to explain ‘reality’ without looking at the ‘supernatural’. 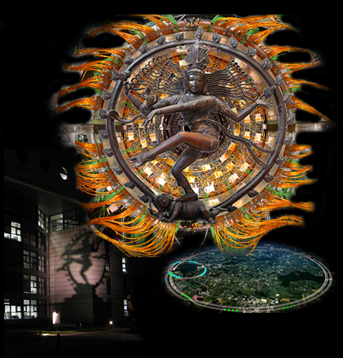 Will we soon learn CERN is really the ‘ultimate stargate’ and one of the gate-keepers most closely guarded secrets? Will this be the way man attempts to break the ultimate ‘God barrier’, an attempt to encounter demi-God’s in an all-out rush towards the destruction of all creation? We understand they won’t be releasing the secrets until they’re prepared to release them. Astrophysicist Neil de Grasse Tyson has also sounded the alarm in a hypothetical manner by telling anyone who might want to ‘blow up a planet‘ how to do so…is this CERN’s attempt to do so by attempting to ‘recreate’ the big bang within a man made structure that has frightened Stephen Hawking so much? Do they know that they know that they know what they’re doing? First, deGrasse Tyson said, any Imperial sympathizer looking to make that happen would have to calculate the planet’s binding energy, in order to determine how much energy it would take to overcome the gravitational forces binding the planet together. The 3rd video below is an excellent compilation called “CERN: Supercolliders, Subliminals, & Stargates: Illuminati’s Plan for Satan’s Arrival” while the 4th video is a NOVA documentary on CERN and the final video is from FreedomFighter2127 in which the videographer offers his own evidence and opinions on CERN and its’ tie in to “2015: The International Year of Light”. In Closing, from Steve Quayle: THE LIVING GOD, THE LORD GOD OF HEAVEN, CREATED ORDER OUT OF CHAOS -THE ANTAGONIST OF MENS EXISTENCE (SATAN), WHOM CERNS STATUE OF ‘SHIVA’ REPRESENTS IN HIS COSMIC DANCE OF CREATION AND DESTRUCTION, IS NOW IN THE PROCESS OF REVERSING THE PROCESS OF CREATION, AND IS NOW GOING FOR DESTRUCTION. “CHAOS OUT OF ORDER” AND THE ULTIMATE DESTRUCTION OF A ONCE BEAUTIFUL PLANET AND IT’S INHABITANTS IS NOW ONLY A SHORT PERIOD OF TIME AWAY! Nice web site…many blessings sister. Thank you, dear 🙂 God bless you as well!